The perfect gooey, fudgy, vegan, gluten free brownies full of wholesome ingredients, antioxidants, protein, and fiber! Say goodbye to unhealthy saturated fats and hello to brownies for breakfast! How would you describe the perfect brownie? For me, the perfect brownie is fudgy, gooey, soft, and chocolate-y. 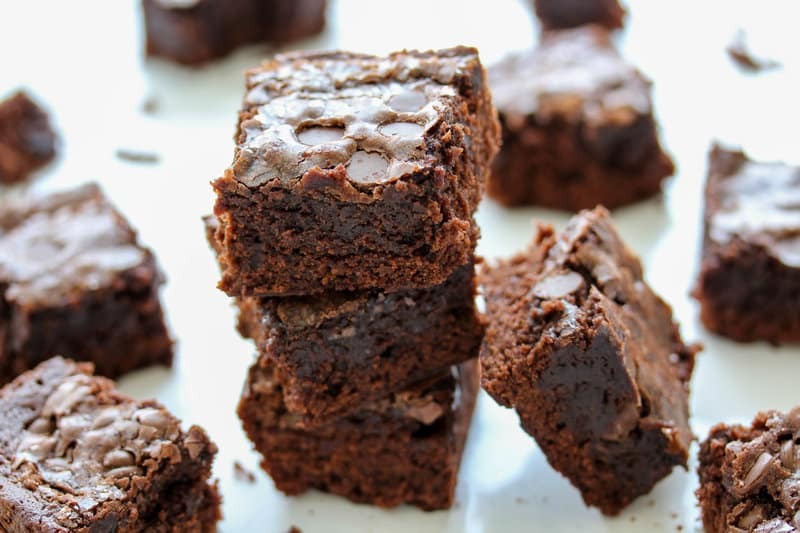 The main ingredients in a brownie recipe that contribute to those great characteristics, unfortunately, are not-so-great for you butter and sugar. 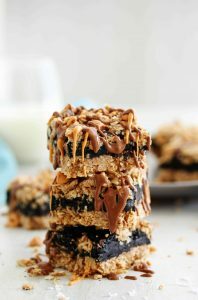 My mission: create a brownie with healthy ingredients that still has the very distinct flavor and texture of a brownie. These amazing brownies are lacking NONE of the fudgy gooey-ness. What they are lacking is the unhealthy saturated fats found in traditional brownies. Thanks to the dates, nuts, and protein powder, these amazing treats are full of antioxidants, healthy fats, protein, and fiber. 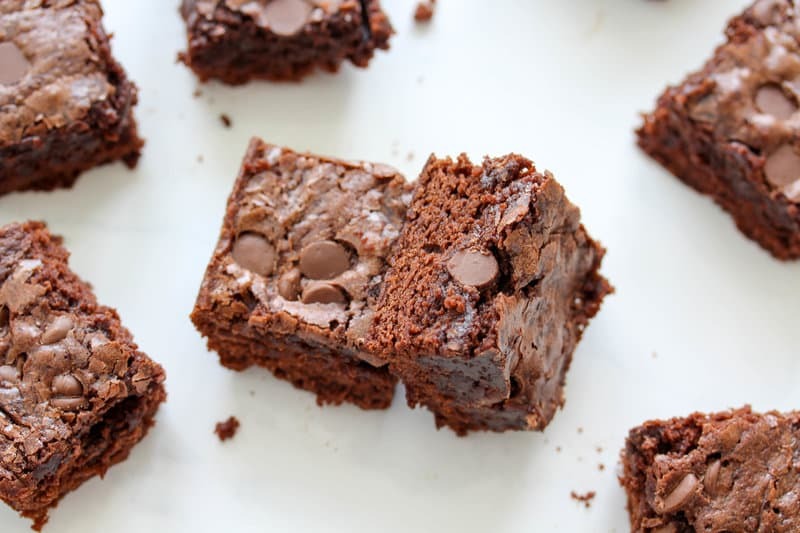 You could actually eat these brownies for lunch! When you start combining the wet and dry ingredients, it might seem like something is going wrong. It will look like there is not enough of the wet ingredients to coat all the dry ingredients. Keep stirring and folding everything and eventually all the ingredients will come together. You don’t want a “soupy” batter because that will make the texture more cake-like than fudgy, and for brownies we want that distinct fudginess! If you make these brownies (and you won’t regret it if you do, promise!) be sure to tag me @HealthyHacksRD! I love to see your creations! Preheat oven to 325 F. Grease or line with parchment paper an 8 X 8 square pan . Pour the nuts into a food processor or blender and chop until the nuts are a nut butter-like consistency (about 5 minutes). Every few minutes, scrape down the sides. Once soft, add the water and the dates to the nut mixture. Blend again until you get a smooth consistency. In a large mixing bowl, combine the cocoa, sweetener, flours, protein powder, cornstarch, salt, and baking soda. In a small bowl, combine the nut butter/date mixture, egg whites (or flax “egg”), milk, yogurt, and vanilla extract. Pour the wet ingredients into the dry ingredients. Stir to combine. The mixture will appear to be very dry, but continue to stir and fold and all the ingredients will come together. (NOTE: if choosing the vegan option, you may need to add more liquid. Add 1 Tbsp of milk of choice at a time and stir until mixture comes together). Mixture will be thick – not runny. Spread batter into prepared pan. PRO-TIP: you can spray the back of a spoon or your hands with cooking spray to help spread out the batter, but do not press the batter down! You want it to fill the pan, but not be compacted into it. 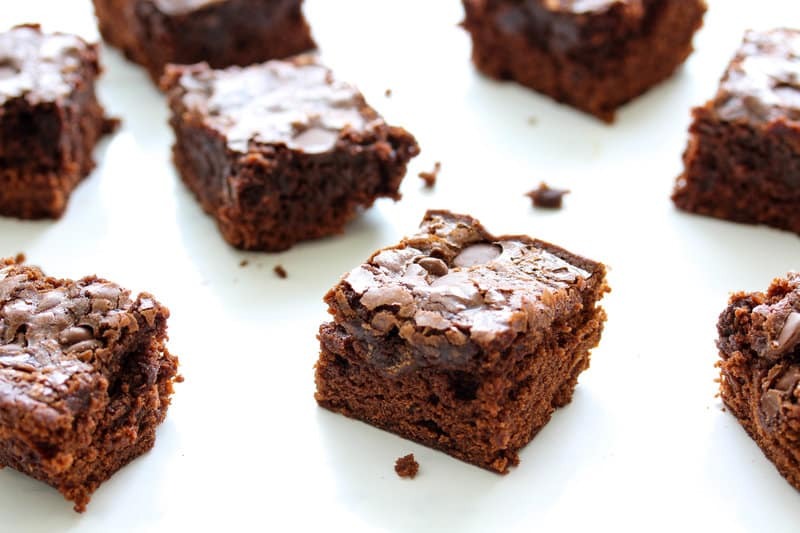 Optional – melt the chocolate chips in the microwave and drizzle over the brownies. Allow brownies to cool in pan. Eat and be amazed by the deliciousness! I bet you could fool anybody into thinking that this are sinful, not healthy! They look like brownie perfection! 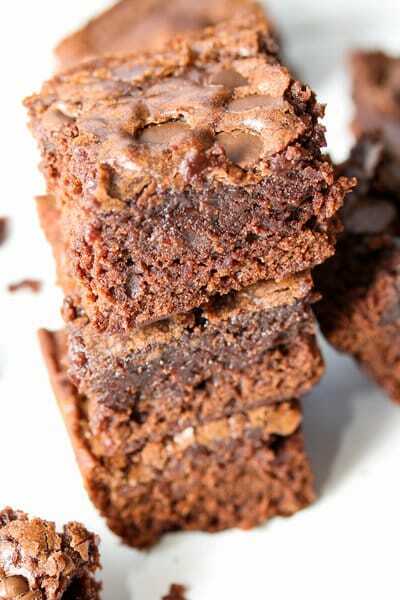 These brownies look absolutely PERFECT!!! 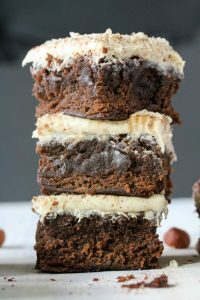 I can't get over the texture, so decadent and chocolate-y!! Hi Lara! I haven't tried subbing out the protein powder, but you could try oat flour or almond flour. Just keep an eye on the brownies while they're baking in case the time is a bit different. Let me know how it goes if you try it out! I think I missed it, but what are you to do with the dates in the recipe? How thick should the batter be? Should it just come together like a pastry dough or more like a cookie dough? I found even for the non-vegan mine needed extra fluid just to get it to come together but it wasn’t going to spread for anything. I don’t know if maybe I needed more liquid still. This type of baking is new to me, so just thought I’d check!